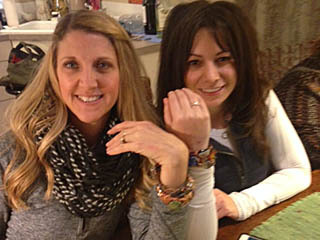 Art Parties in Spokane ~ Fun, Creative & Stress Free ~ For Seniors, Children & Adults! For adults, seniors, teens & children! 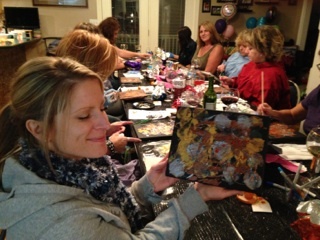 Book a Private Art Party at "The Moon"
or at Your Own Home! All age groups ... no experience necessary! 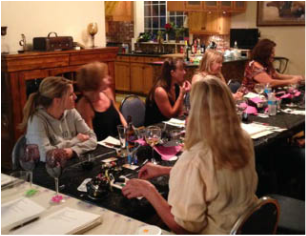 Art Parties bring a creative spirit to your celebrations - it's a terrific opportunity to get together for a small group activity such as birthdays, family fun, mother-daughter dates, bachelorette parties, baby & wedding showers, corporate celebrations, or simply a "friends night out". We can host the Art Party at our New Moon Art Gallery just minutes outside of downtown Spokane (on East Sprague), or if it is more convenient for you, we can come to your home or place of business (which makes for a great exercise in team building!). Everyone will learn to unlock their imagination and will have a great time discovering their "inner artist" ~ it's fun and creative! 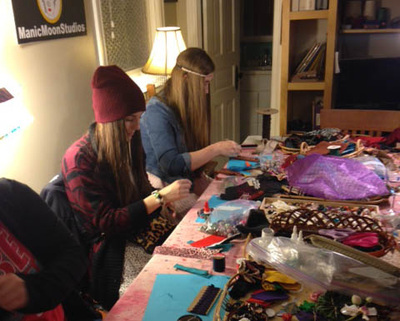 We love working with adults & seniors who want to continue to explore their creativity, or teens & children who are beginning to develop their own creative talents. Moon Gallery Art Parties can be customized to accommodate any age group or level of experience ~ or your particular interests, project ideas and themes ~ just let us know! And of course you can offer whatever drinks and snacks you wish when the Art Party is hosted at your own location. Learn how to make your own art pins, treasure necklaces & bracelets, artisan earrings, fiber art jewelry... we will teach you to make whatever you can imagine, and you can take home & wear your own creation! Landscapes, still life's and more ~ a great party for everyone with an artistic side but without a lot of experience. 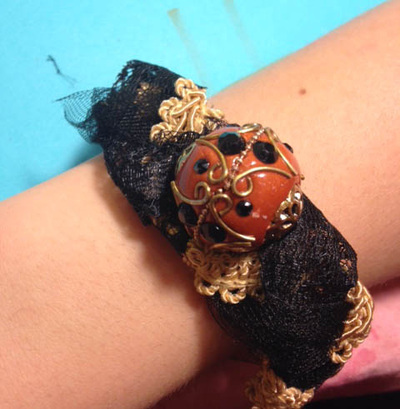 Group project that's perfect for a birthday, wedding, anniversary or shower gift. 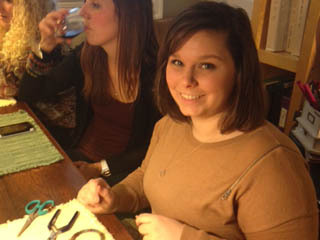 Numerous custom craft projects available, such as: memory boxes, dish gardens, painted t-shirts and so much more. This theme engages people in the hands-on process of making art without the frustration of looking at objects. 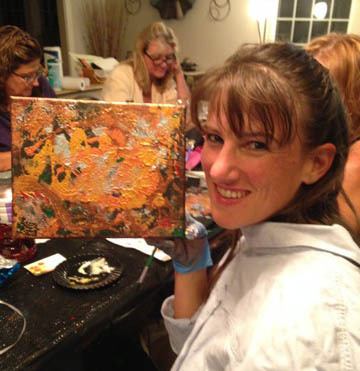 Each person will design a canvas by means of various techniques that encompass color schemes, patterns and paint splattering. This is a project that we have done many times with great success. Following a step by step approach, everyone will have fun drawing or painting themselves (does not have to be realistic). 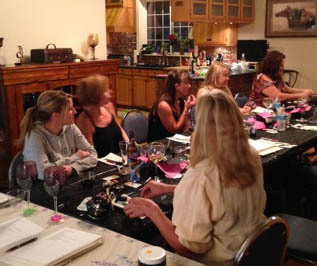 Each guest paints a segment which is then combined to create a unique finished product. For example, hand painted furniture, or painting on canvas, or treasure boxes... the possibilities are unlimited! Do you have your own ideas? 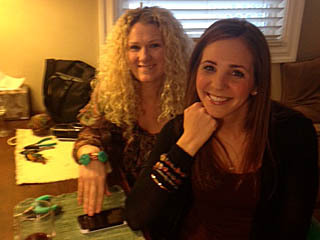 We're happy to work with you to customize your party ~ just let us know! 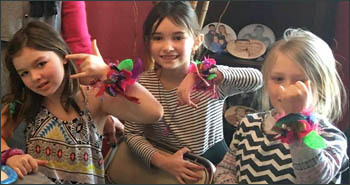 Would you like to have a "Children's Art Party"? 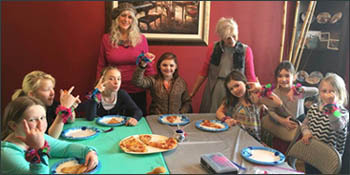 We are happy to design a special party for any age group and experience level ~ give us a call so we can talk it over ~ your kids will have a wonderful time as they learn to develop their artistic abilities! Fundraisers... A Moon Gallery Art Party is a great way for your organization to raise money and provide a really memorable event for your supporters and/or staff ~ give us a call at 509-475-4979 for the details. 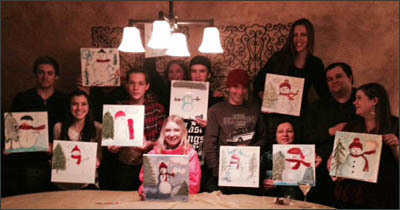 Most importantly, our "Art Parties" are designed to be playful and stress-free! New Moon Gallery artists will demonstrate what you need to know ~ no prior art experience necessary! 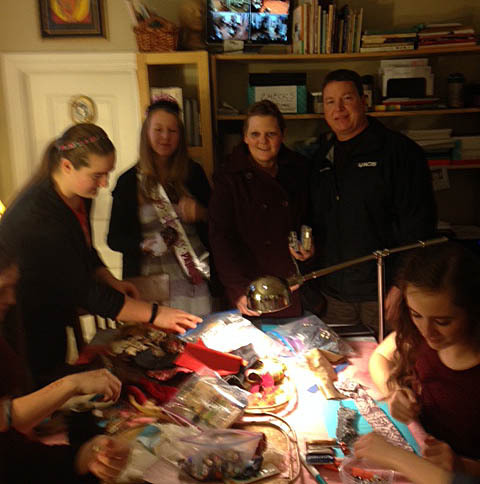 Hours for an "Art Party" are flexible ~ if you live in the Spokane area and are interested in a Moon Gallery Art Party, please call us at 509-475-4979 or click HERE to send us an email. Please contact us as soon as you are ready ~ dates fill quickly!